In my work with speakers, I’m always looking for the best tools to help us manage projects and to keep all the processes I’m working on organized. Over the years, I’ve tried or tested dozens of these tools. Why Use Project Management Tools? Even if you are the only person in your office, you need a way to identify and manage all the tasks that go into running your business. For some of us, there is a pad or notebook that stays with us all the time. For others, a collection of sticky notes (actual or electronic) littering our desktop. We all have some system in place to (hopefully) keep all the things we need to do organized so we don’t forget them. But when we need to work with others, when we need to collaborate and share responsibility, we need management tools that allow us to keep all the tasks, the comments, the files – The Work – in one easily managed, use-able, centralized place. You could pay a premium for a collection of features that you may, or may not, really need. Or, you could choose a tool that offers the capabilities you need, without all the clutter you don’t. Most of us don’t have the time to learn a complicated system just to keep the details of the things we are doing organized. With that in mind, there are two tools that I recommend to my clients, and use in my own office, on a daily basis. Asana is a web-based, online tool that, “… puts conversations & tasks together, so you can get more done with less effort.” At its heart, Asana is a multi-level task list, but with over 40,000 users and free accounts for organizations with up to 15 users, it really is so much more. I use Asana to track every task and project for every client I have. I can break tasks into manageable sub-tasks, assign tasks to members of my team (anyone assigned to the project), set due dates and reminders, make comments, and attach files from Dropbox or my computer. For some speakers, the industry standard tools just don’t allow for the flexibility that they need to manage the logistics of their programs. Asana is a great tool for those situations. In fact, one of my clients manages her entire lead-program-followup process using the task management functions of Asana. Whether you need to manage a detailed project with your team, monitor recurring internal tasks, or just keep your personal to-do list organized, Asana is more than up for the task. For free. 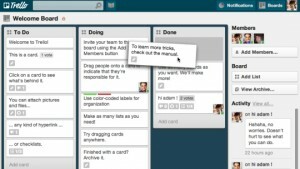 I tried Trello a few years ago and wasn’t nearly as impressed as I had wanted to be. 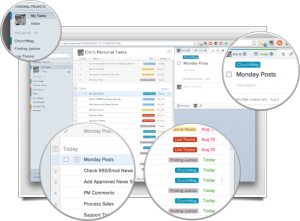 Since then, however, it has grown into a great tool for managing projects with clear, visually appealing “cards” that you move from one step of the process to another as you complete each task. I was able to test the entire system while collaborating on a project recently and found Trello to be a wonderful tool for organizing projects with clear goals and end-points. Trello allows for the attachment of multiple file types, assignments, and comments, and the visual way that projects and tasks are displayed offers a great “snapshot” of your project’s status. The user interface for Trello took me a little longer to get used to than Asana, but that was more about my learning preferences than a problem with the program. Overall, Trello is an excellent tool for managing your project details. Both of these tools are browser-based and have iPhone and Android apps. That means that they are great for those of us who work pretty much anywhere. And yes, there are other management tools that may be a better fit for you. But when you start researching those tools, I really recommend that you check these two out.